Are you a fan of ‘Little Shop of Horrors’? I am not the biggest fan of the original Roger Corman movie but I love the musical version. I would be thrilled to see it on stage some time. Aside from the wonderful musical numbers by Ashman and Menken, the man-eating plant from outer space, Audrey II, is an inspired and fantastic movie monster. 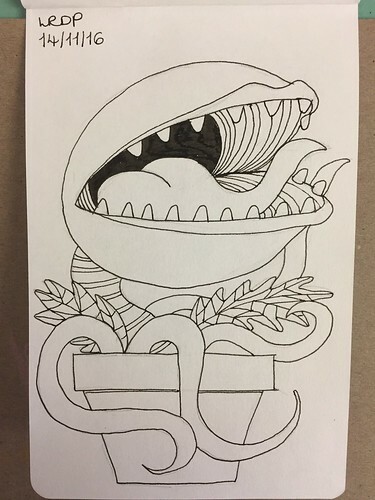 Audrey II, therefore, had to appear in my Inktober sketchbook and proved to be an ideal drawing on a day when I had zilch free time. A quick, simple line drawing was just the ticket.